Bistro du Vin Soho is the second in the Bistro du Vin chain of restaurants, the first being in Clerkenwell. Situated in the ‘Mecca’ of Soho, Dean St, it has as its neighbours Dean St Townhouse and Quo Vadis (which coincidentally has installed a new chef since I last went). 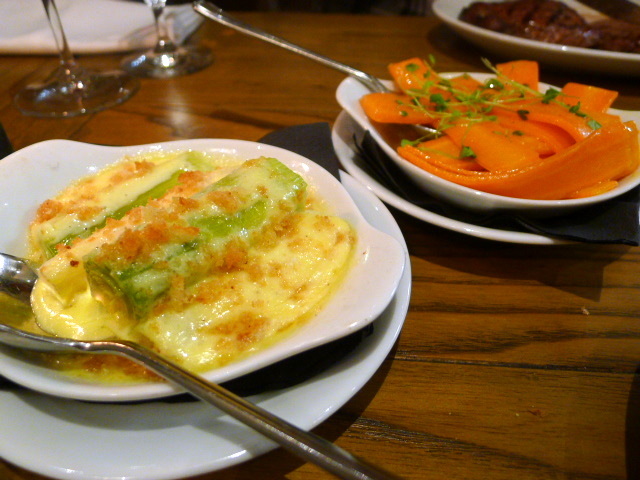 A French Bistro, its menu is simplistic in its approach but reasonably appealing. The décor suits its French Bistro status and its location well. The restaurant has a rustic and stylish appeal with cream coloured wooden panels and lots of comfy leather booth seating. An ox tongue, beetroot and walnut salad (£6.50) with a ravigota vinaigrette containing capers, shallots, parsley and gherkins was lovely. 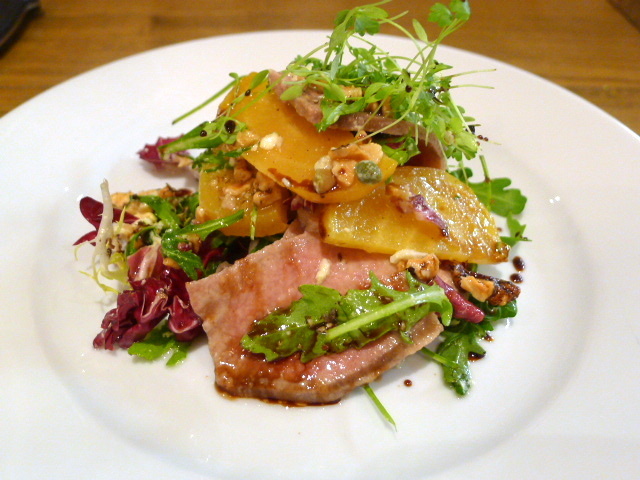 The ox tongue was well cooked and tender, the walnuts gave the salad crunch, and there was a nice balance of acidity and sweetness coming through from the dressing. 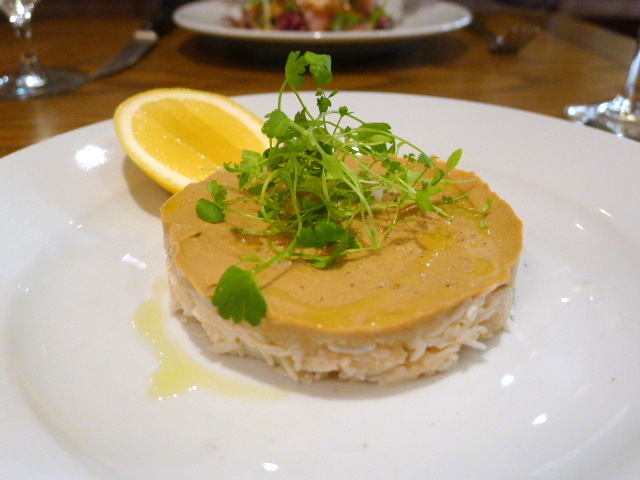 A Cornish crab salad (£9.50) was resoundingly fresh and flavoursome. There was a good balance between the white and brown meat. Steak was what appealed on this occasion – something grilled – and we went for the 35 day aged Longhorn rump (£26 – 400g) which was cooked to a wonderful pinkness. 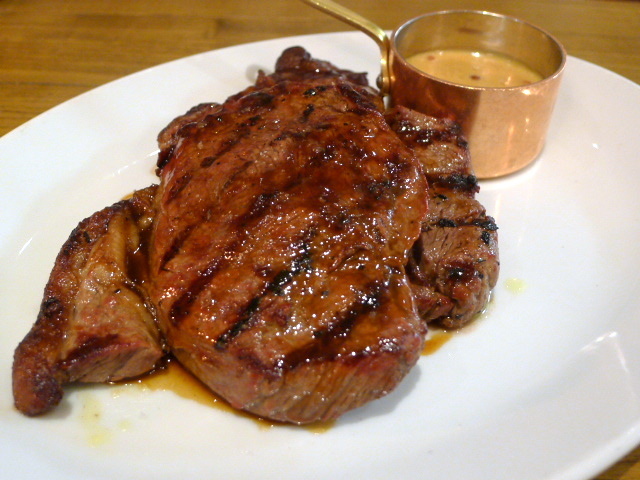 There was a wonderful robust beefy flavour coming through from the meat. 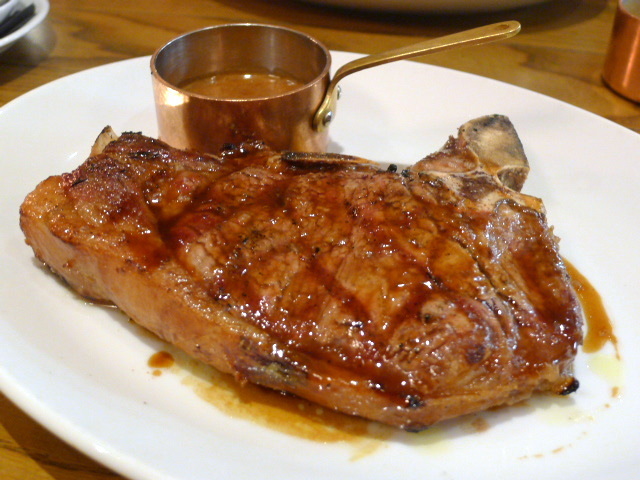 A Belted Galloway bone-in sirloin (£29.50 – 500g) was also enjoyable and tender. The side dishes were less successful however. Creamed leeks (£3.50) were tough to cut and difficult to eat although the creamy topping of thyme and garlic was nicely done. Carrots (£3.50) glazed with star anise and orange were a touch too sharp and tart. And even though we ordered steak, unfortunately I can’t comment on the frites as we didn’t try any. Normally vanilla ice cream is used to fill the profiteroles, but I opted for the cornflake ice cream instead which was delicious. It might seem like an unusual choice, but it still worked with the profiteroles as the cornflake flavour was quite gentle. 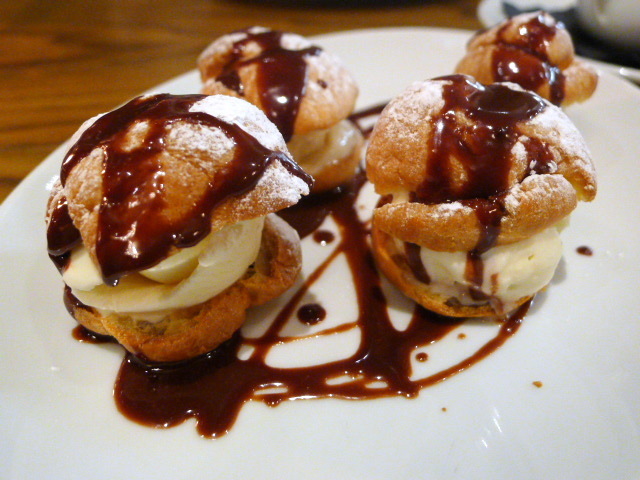 On its own, the choux pastry was dry, but this was helped by the lovely chocolate sauce and the ice cream. 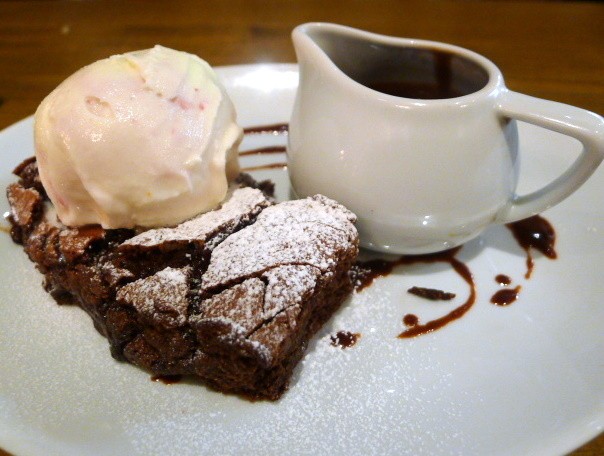 A chocolate brownie (£5.50) with its gooey softness was decadently good. It was also served with vanilla ice cream and chocolate sauce. There were some minor hiccups but overall the cooking was well executed and the food was enjoyable. On the night of our visit the restaurant was very quiet and it is hard to say if the service is much different on a busier evening. But I was surprised that Bistro du Vin didn’t have a better attendance. The good standard of the bistro food would justify it. I dined as guest of the restaurant. Price range: £23 – £74 for three courses. Excludes drinks and service.